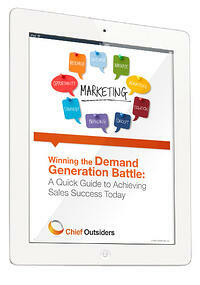 Download our eBook, "Winning the Demand Generation Battle" to gain valuable insights that will help you achieve sales success in today’s plugged-in environment. When consumers are on their quest to find the perfect next “thing” upon which to lavish their cash, they leave behind a passel of digital information. These bits and bytes, when properly harnessed, can help marketers regain – and maintain – a decided edge in winning the demand generation battle. In this eBook, we will arm you with enough information to begin a purposeful dialogue within your company about how to deftly navigate this pulsing technological minefield, and emerge with mindshare, marketshare – and wallet share.